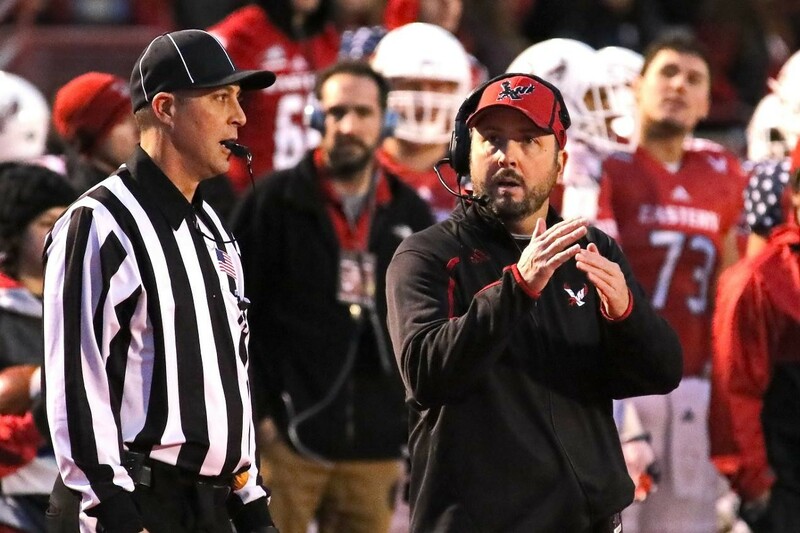 On Saturday the 18th-ranked Eastern Washington Eagles (6-4, 5-2 Big Sky) will host the 11th-ranked Portland State Vikings (8-2, 5-2 Big Sky) with their playoff hopes on the line. After a devastating 57-16 blowout loss on the road to the now 17th-ranked Montana Grizzlies last weekend, the Eagles have fallen from fourth in the nation to their current ranking, while watching their hopes of a fourth consecutive Big Sky Conference title vaporize. EWU Eagles head coach Beau Baldwin takes a timeout during the Homecoming game on November 7 against Northern Arizona. That being said, despite the tough losses and nail-biting victories, the Beau Baldwin-led Eagles still have a shot at making the FCS playoffs. Consisting of 24 total teams, (11 automatic bids for conference champs and 13 at-large bids) the FCS has been using a playoff system for years. Since EWU lost to Northern Arizona at the beginning of November, the Eagles' statistical hopes of winning the conference outright have been eliminated. Translation: Saturday's game is a must win for Eastern if they hope to get one of the at-large selections. It has been an up-and-down season for the Eagles, who won six in a row after starting the season 0-2 against Oregon and Northern Illinois. While the season has been unpredictable for Baldwin's team, one thing has been as consistent as ever—Cooper Kupp. Since Kupp set the EWU record for single-season touchdown receptions as a redshirt freshman in 2013, everybody that knows anything about Eagles football has known that this kid is special. Whisperings of the receiver's potential in the NFL draft—even the second or third round—have been circulating around the football world ever since. But FCS prospects are almost never valued as much as FBS players, and FCS stars often go overlooked in the NFL draft. So, should Cooper Kupp be taken seriously as an NFL receiving prospect? His performance against Oregon should be enough to answer that question. Kupp, widely considered to be an excellent teammate, has a few things to consider in his decision. On top of the money, fame and potentially unbreakable records that the 22-year-old has to mull, his little brother, freshman linebacker Ketner Kupp, also plays football for Eastern. To many it would seem an easy decision for Kupp to take his 303 career receptions, 55 career receiving touchdowns and 4,628 career receiving yards to the NFL. He has NFL-level talent, and could cash in on that ability right now. However, Eagles fans everywhere would like to believe that there is more for Kupp to consider than just money and fame. With one more year of eligibility, Kupp could become the greatest FCS receiver of all time, statistically speaking. Kupp's 303 career receptions currently rank 8th in FCS history and 92 behind the career record of 395. With one regular season game remaining in 2015, Kupp has averaged 101 receptions per year in his three seasons. In addition, were number 10 to play another season, he would likely become the FCS career leader in receiving touchdowns and receiving yards as well. Kupp currently has 55 career touchdown catches, only three behind the FCS record of 58 set by New Hampshire's David Ball (2003-2006). Yardage wise, the Yakima native sits at 4,628, leaving him only 622 yards away from the FCS record for receiving yards. Kupp has an intriguing decision to make. He can go to the NFL, where his stock will inevitably be underestimated, or he can play another season with his brother. He can enter the draft now to avoid an injury next season, or he can take the risk and likely set records that may never be broken. Eastern receiver Cooper Kupp dashes for a 40-yard score at home against Weber State on Halloween. Although Kupp ranked as high as 80th overall entering the 2015 season in Matt Miller's 2016 NFL Draft projections on Bleacher Report, his stock would most likely be even higher in the 2017 draft, assuming he stayed healthy. According to the CBS Sports 2016 NFL Draft Prospects, Kupp is currently ranked 138 overall and is considered the 19th best receiver in the draft pool. If Kupp stayed at Eastern for his senior season, the ranking has him projected as the 15th best receiver in the 2017 draft. Only Cooper Kupp knows how he feels about his impending decision. Perhaps he has not even come to a decision yet. As the Eagles face the potential end of their season on Saturday in Cheney, Kupp and his teammates will be fighting to make the playoffs. If they lose, their season is over. 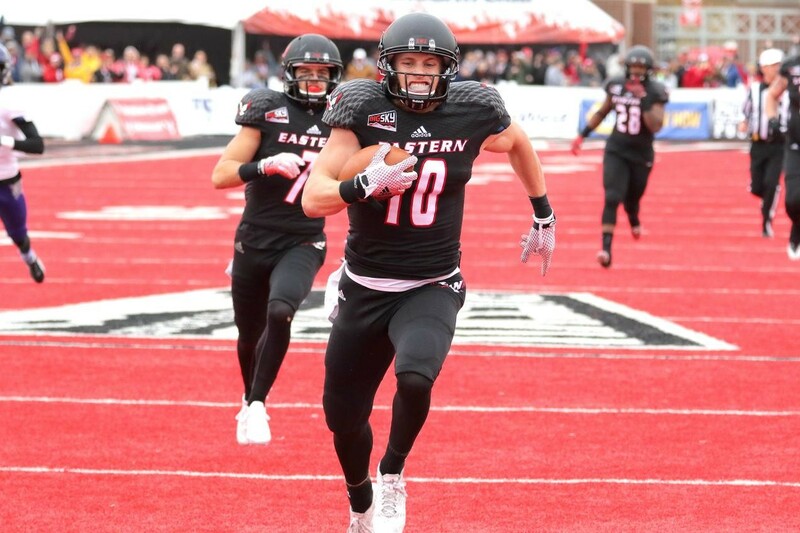 It is unknown whether the outcome of Saturday's meeting with Portland State will influence Cooper Kupp's decision to stay at Eastern or enter the draft. That being said, with the stats that Kupp has compiled in only three seasons as an Eagle, it seems logical for the humble receiver to go pro. There are still tickets available for what could be Kupp's final game as an EWU Eagle, but they are numbered. Get 'em while you can. Here is a compilation of Cooper Kupp's highlights through the 2014 season, credit to Ben Brave Productions. Enjoy.